The draft manuscript for Holmes Volume One set off on it's electronic journey to the fine people at Sixth Element on 14th September to begin it's first steps on it's road to being published. With my job more or less complete it's now over to the experts Gillie and Graeme to turn my writing into something fit for human consumption. The process of publishing a book really is a bizarre and exciting experience, with creative meetings, photo shoots and the talk of book signings, launch parties and perhaps even possibility of an interview on local radio. Mmmm, really not something that I'm used to. Obviously the hope is that Holmes Volume One sells in it's thousands, the manager of WH Smith, Teesside Park has pre-ordered twelve copies on the strength of the concept. However, even it it all ends up in an Alan Partridge-style book shredding it has been a thoroughly enjoyable experience. An experience I would recommend to anyone. You never really know, but all the indications are that the book could have an audience. Having touted it around numerous friends and colleagues the feedback has been overwhelming positive, with all those providing comment credited in the book. I can't really thank these fellas enough. If it not for their encouragement I don't think I would be at this point now, standing on the verge of becoming a published author. How good does that sound. A special mention goes to Mick Richardson, Mick Streets and Rich Walker for their voluntary contributions with respect to edits and proof reading. 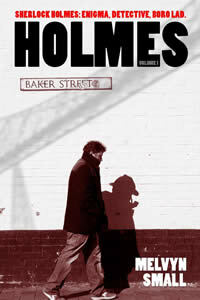 Holmes Volume 1 will be published in ebook and paperback around November time. If you would like to receive an email when it does hit the shops then please sign up to this newsletter using the mail button below.